The Terra Nova, last of the great luxury liners from the Combine’s heyday, is dead, a victim of disaster now drifting in the space between worlds. Her final call echoes across the Bleed. The last of the survivors clutch desperately to life, waiting for rescue. All but one, that is. One of them waits only for a chance to finish the job, uncovering a secret which the Terra Nova has kept hidden for decades. The price of that revelation will be paid in blood. 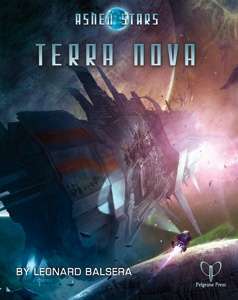 Terra Nova is an adventure for Ashen Stars by Leonard Balsera author of Profane Miracles and co-author of the smash hit Dresden Files. It features a novel use of GUMSHOE where the culprit isn’t set in stone in the adventure’s text.